Today, I am going to take you for a stroll, rather a ghost one as we are going to walk along a small river now all buried under the pavement when it enters Paris: its name – la Bièvre. 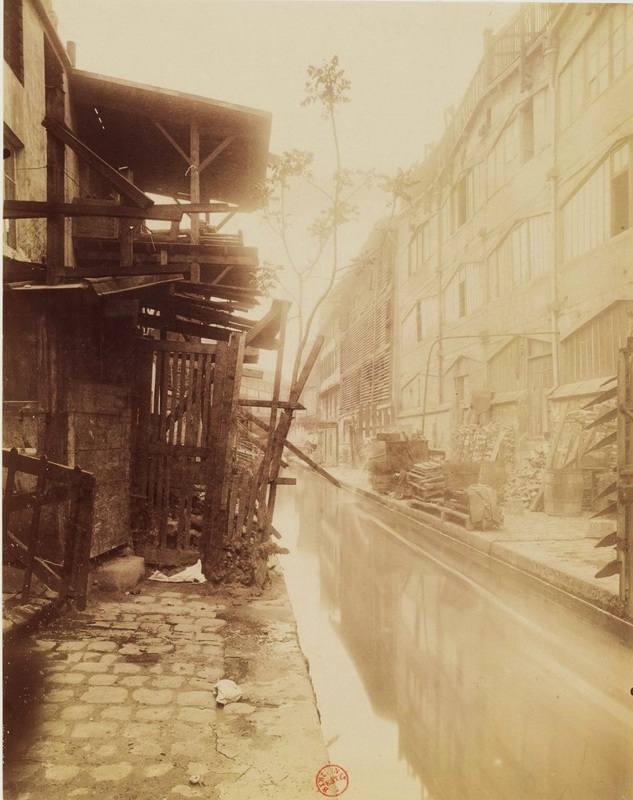 When Atget took pictures of it at the beginning of the last century, it was still partially visible in the southern part of Paris, in the 13th district, between Poterne des Peupliers and rue des Gobelins before it was completely buried and integrated with the sewer network of Paris. The river begins at Guyancourt in the forest of Versailles, flows through the cities of Jouy en Josas, Bièvres, then becomes an underground river in Antony, flows through Fresnes, Arceuil, Gentilly and finally enters in Paris where it joins the Seine river. It is thought that its name, Bièvre, comes from the fact that in the past many beavers (beber in Celtic) were living in the river. However, this is not attested and it is also thought that the name would come from its brown color due to the sludge (boue or bourbe in French) it contains. 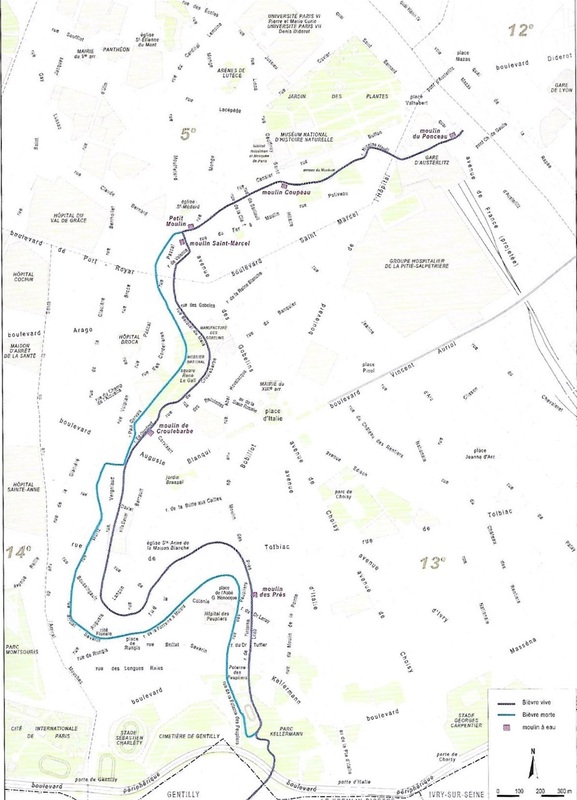 The course of the river mapped against the today Paris was starting in the south under boulevard Kellermann, then was following a large meander around a hill, Butte aux Cailles. In this area, called la Glacière (the ice-house), there were flood-meadows, where the water was easily transforming into ice during the winter. Then, the ice was cut and kept in the stone quarries to be later sold during the summer. 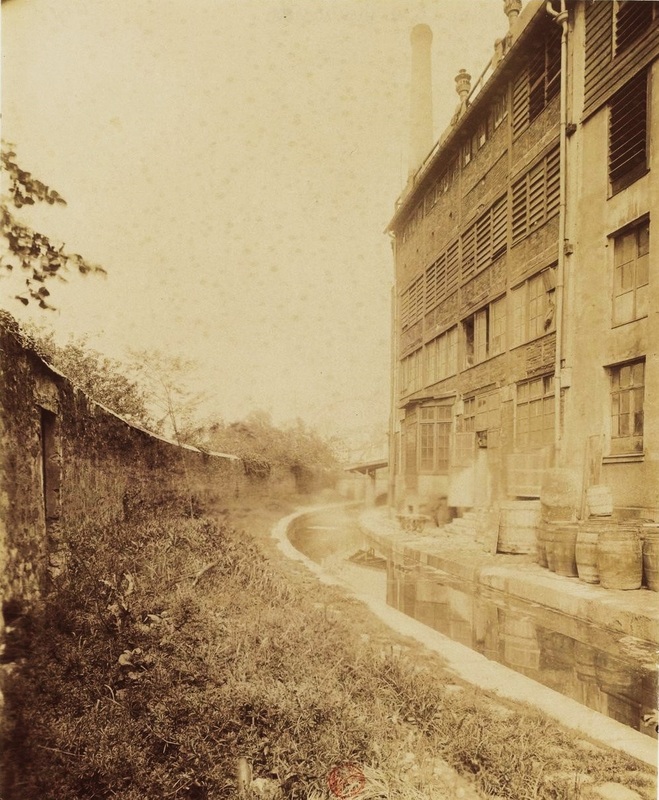 Leaving the Butte aux Cailles , the river was running along the Gobelins Manufactory, settled on its banks. 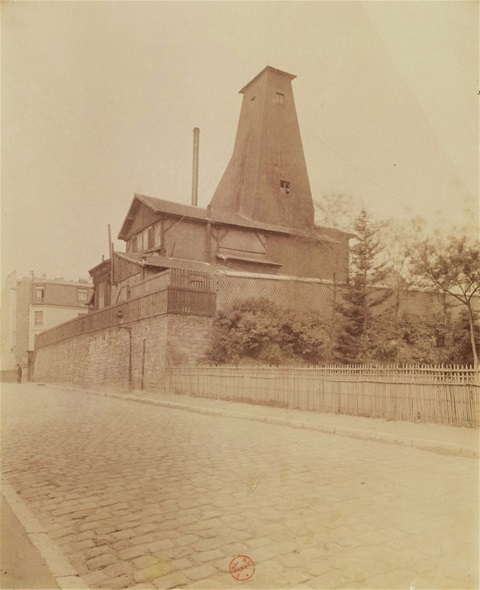 All polluted by the dyeing activity of the manufacture and also by many of the tanneries settled along the river, it was finally running along the Jardin des Plantes to end into the Seine between the Austerlitz bridge and the Charles de Gaulle bridge. During the 12th century, the Saint-Victor Abbey was permitted to divert the Bievre river in order to power their mills and water the gardens of the monastery. 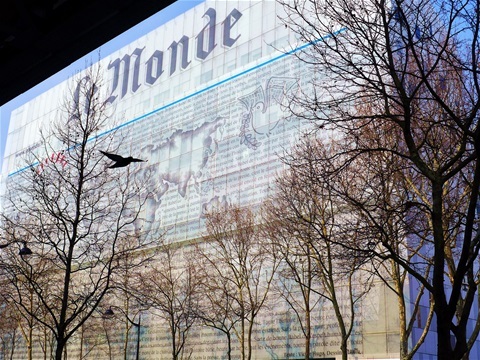 This diversion called the Canal des Victorins was starting from the National Museum of Natural History, then flowing up to Saint-Nicolas du Chardonnet church and was finally running along the today rue de Bièvre to end into Seine river at the level of Cathedral Notre-Dame. 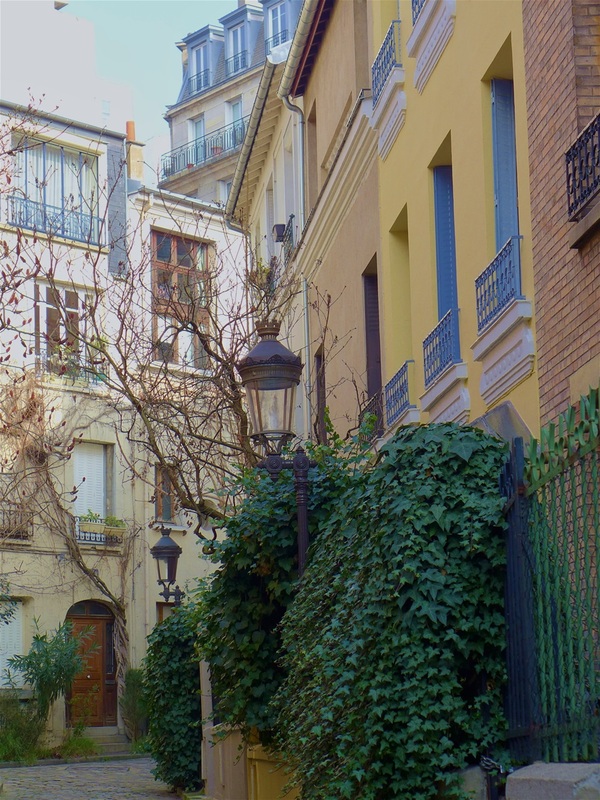 Our walk in the streets will follow its route even though it is today integrated into the sewer network, from parc Kellermann up to Jardin des Plantes, and if you wish, we will follow Canal des Victorins and end our stroll in rue de Bièvre. 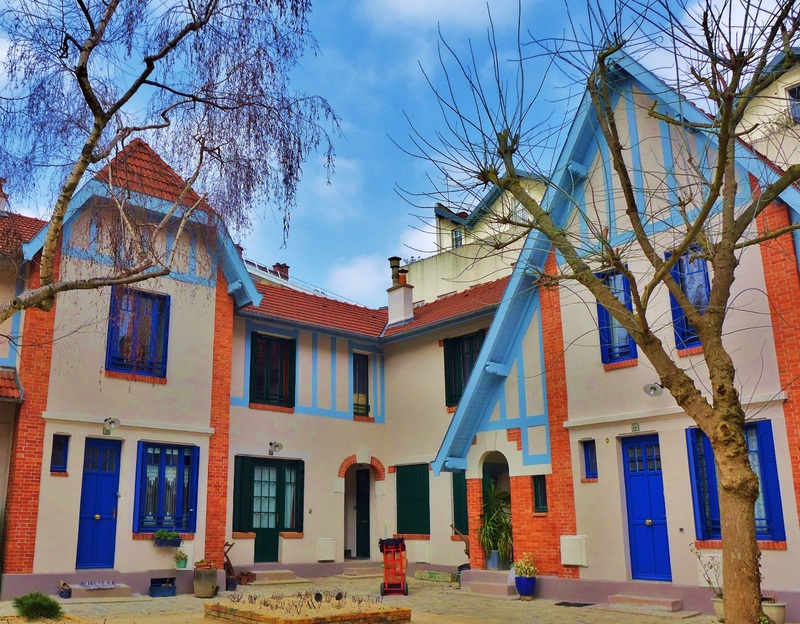 The French writer Joris-Karl Huysmans was very well describing the misfortune of the overexploited and polluted river because of the tanneries, the leather-dressing factories and dye works until it ends in the sewer. His descriptions meet wonderfully the pictures taken by Atget. 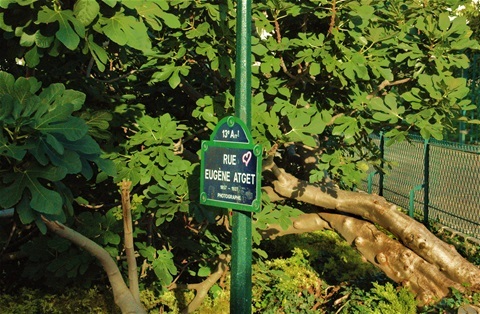 Furthermore, when we will walk between la Butte aux Cailles and boulevard Auguste Blanqui, we will have the opportunity to honor Eugène Atget when we will go down the stairs of the street named after the photographer. For this stroll, it is better to do it during the summer months in order to enjoy the many gardens and to visit château de la Reine Blanche. 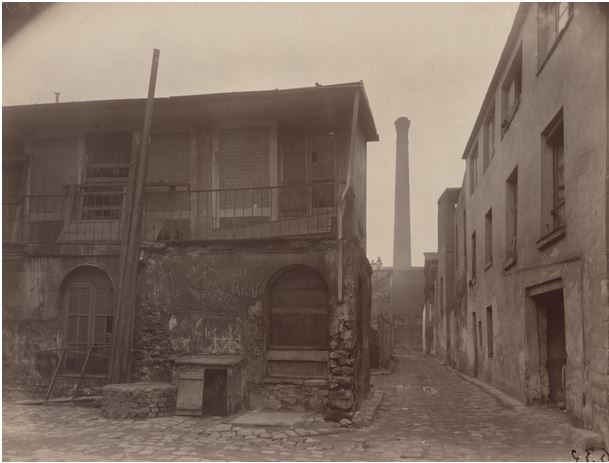 - Butte aux Cailles, jardin Brassaï, rue Eugène Atget. 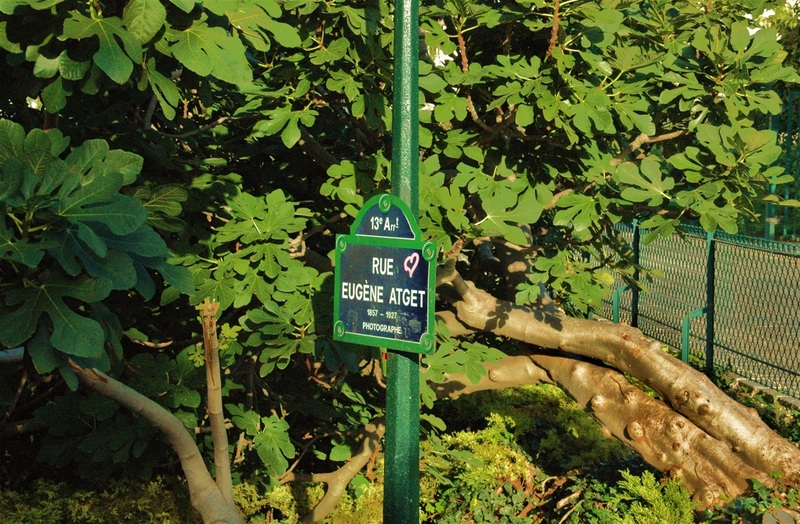 You may stop at Jardin des Plantes, or you may continue following Canal des Victorins through Jussieu up to boulevard Saint-Germain and end rue de Bièvre. 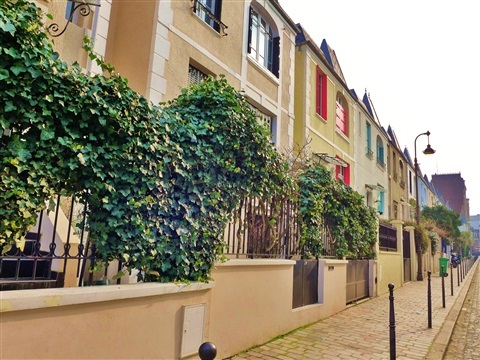 When going out of the metro at Maison Blanche, let’s cross avenue d’Italie and enter into jardin du Moulin de la Pointe. In the past there were many mills along the river Bièvre. This garden reminds of the mill (moulin) which was built at the end of the path (de la Pointe) leading to the Fontainebleau road, today avenue d’Italie. We now cross boulevard Kellermann and we enter in another small garden, Jardin du Monument aux Mères Françaises honoring the French mothers raising their children alone after the first World War. Then, we are reaching parc Kellermann where we arrive directly on the bastion of the old fortifications built in the 19th century. 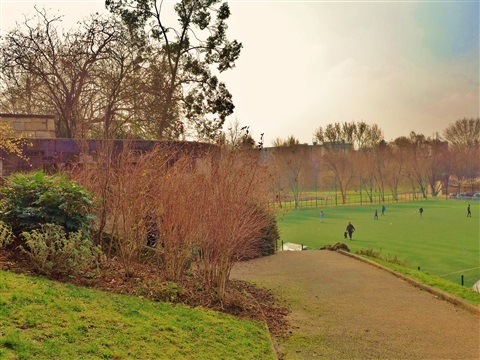 From there, we have an overall view over the park, built on the former bed of the Bievre river. Where there is the pond today, the river was divided into two parallel flows: the native flow (slower, so-called Bièvre morte - Dead Bièvre) and the artificial one (with a higher water flow, so-called Bièvre vive - alive Bièvre). These two river flows were winding in parallel and finally joining the Seine river. With the division of the river, the water flow was then higher in order to supply the mills built along its banks. Here in this park, between Gentilly and Paris, the river stayed uncovered until 1935, a lot longer after the last open-air section of the river within Paris was finally covered in 1912, making the river completely integrated within the sewer network. The picture taken by Atget is showing the Bievre river (the artificial arm of the river) leaving a peaceful countryside to enter in Paris through the wall of the fortifications. The view is very bucolic, even more when we know that on the other side of the wall the river is going to be swallowed by the polluting city. Let’s follow rue Max Jacob along the stadium and take on our right rue de la Poterne des Peupliers. Rue de la Poterne des Peupliers follows the old curve in the Bièvre (natural arm). We are walking under the Poterne des Peupliers bridge which in the past was going through the walls of the fortifications and a second one which was going below the railway of Petite Ceinture (circular railway supplying the fortifications). The Bievre river (natural arm) was entering Paris through these two openings. We now continue on rue des Peupliers up to place de l'Abbé Georges Hénocque, then on our right in rue Henri Pape up to rue du Moulin des Prés (Mill in the meadows). On the ground, a medallion ancien lit de la Bièvre (former bed of Bièvre river), among many others showing the path following the bed of the former river, is reminding us that standing there was a mill from which the street got its name. The sweet little houses, place Hénocque, rue Dieulafoy, rue du Moulin aux Prés, square des Peupliers could make us think we are somewhere outside Paris, and indeed were making me dreaming when I was living at the corner of rue de Tolbiac and passage du Moulinet. When arriving on rue de Tolbiac, let's turn on our left, and continue up to rue Vergniauld where the artificial branch of the river was flowing. 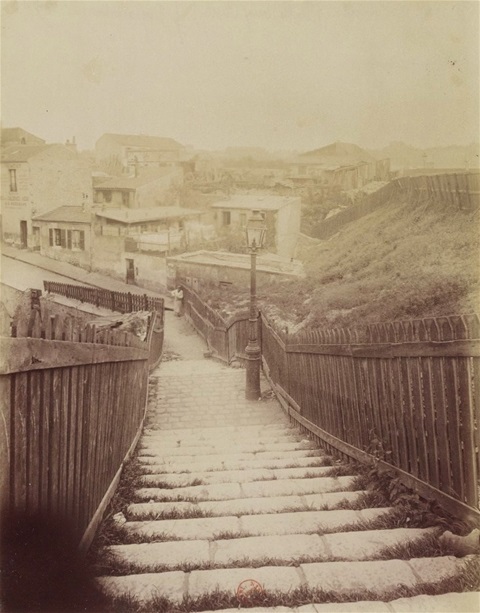 The picture taken by Atget in 1900 is showing the filling of the Bièvre valley already partially done: with a close look, it is possible to guess where the bed of the river was, on the right of the street lamp, between the house and the excavation slope where rue Vergniaud is standing today. The small house on the left with the shuttered windows was located at n°2, rue de la Colonie (the community). The name of the street is due to the existence of an important community of rag men settled on the bank of the river where they could wash the clothes. Let's now continue on rue Vergniaud which follows the Bièvre Valley, then rue Daviel on our right where we start at the n°10, to take a look at the Petite Alsace named from the half timbered houses typical from the Alsace region, and on the other side of the street, at the quiet Villa Daviel, both built in 1912 with a social purpose. 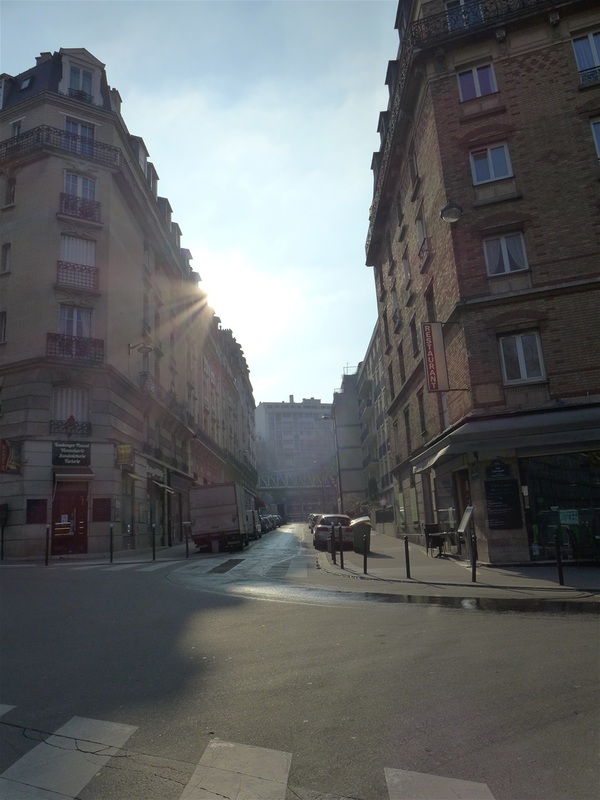 Let’s stop at the top of the street at the junction with rue Barrault; from there we can see where was the Bièvre valley. One arm (the artificial one) was flowing at the level of the Petite Alsace houses and the other arm (the natural one) was flowing at the level of the café with the red shade at the corner of the street. 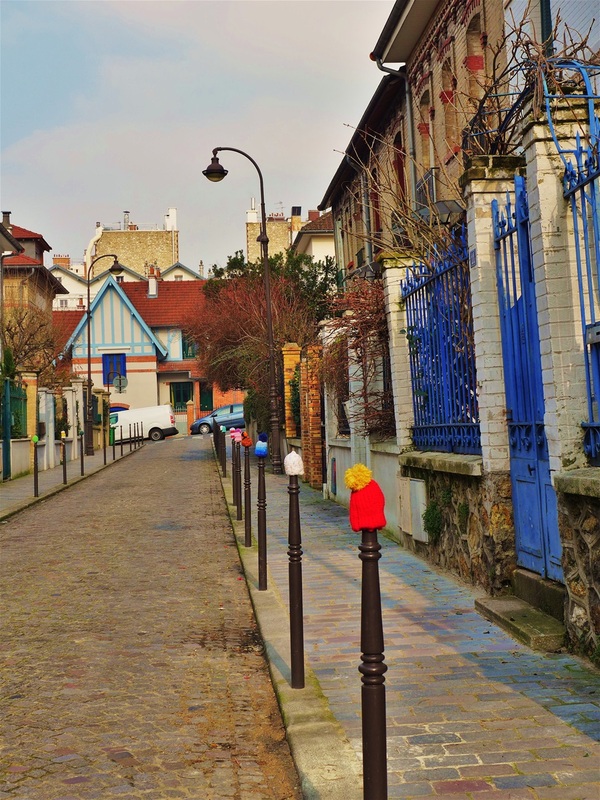 Let’s turn on our left in rue Barrault, then let’s enjoy the walk in the pretty rue de la Butte aux Cailles. We will walk up to its end on place Verlaine. 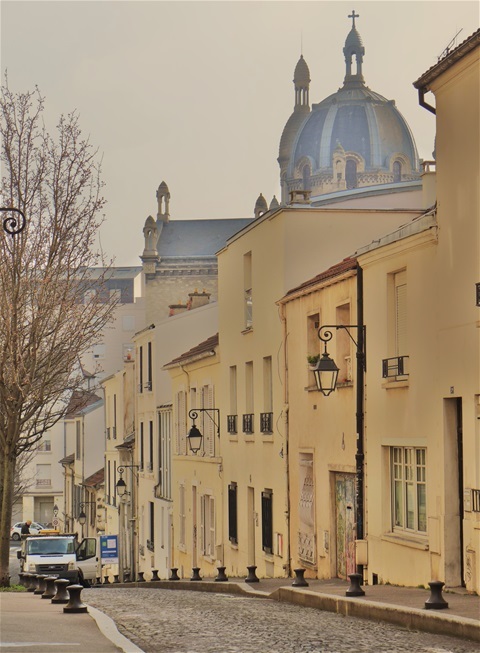 Meanwhile, when we cross rue Buot, let’s enjoy the view, which makes me think of somewhere between Paris and Italy, with the rear of the church Sainte Anne de la Butte aux Cailles in front of which we walked when in rue de Tolbiac. 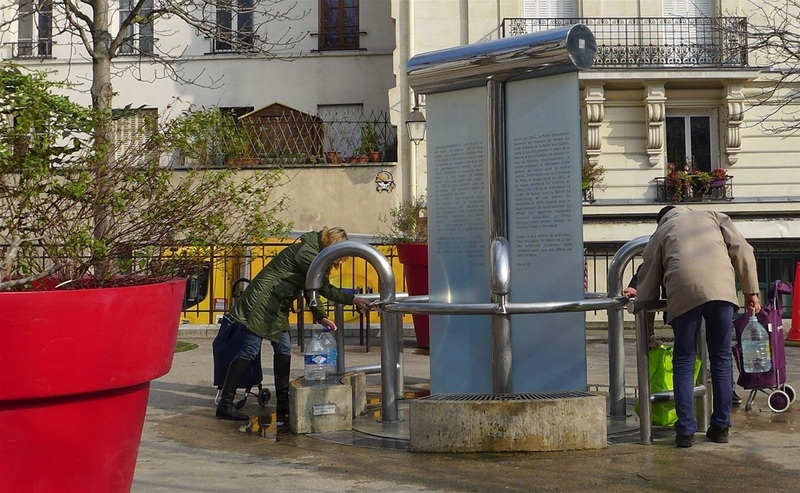 If the artesian well of Butte aux Cailles, located at the corner of rue des Moulins des Prés and place Paul Verlaine was drilled from 1866, it is mostly due to the existence of the Bièvre river. The well had a double purpose: the first one was indeed to supply water to this district located on a hill; the second was to release the extra water in the river often dry during summer. It was planned that the underground pipeline following rue du Moulin aux Prés could release six thousand cubic meters of water in the river per day. However, the project was delayed due to many difficulties and when it restarted in 1903, it was too late as the river was then planned to be covered. The idea of a swimming pool was then found to use the extra water becoming unnecessary. 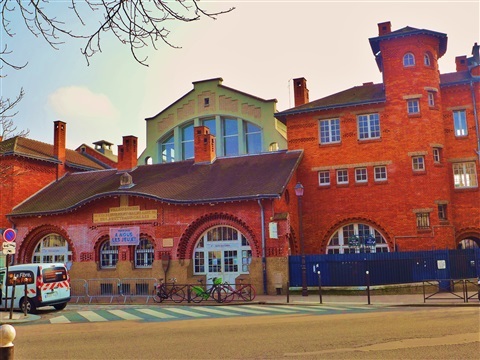 Together with public baths, the swimming pool was built in 1924. 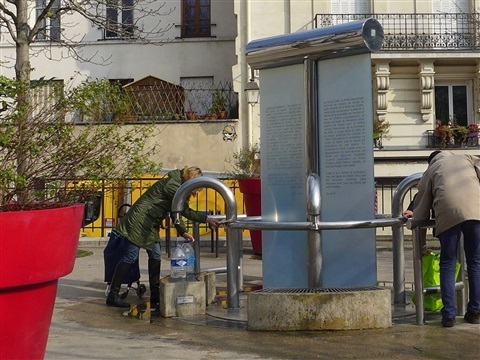 Today, the artesian well is a meeting point for the inhabitants supplied with a clear flowing water extracted six meter deep. 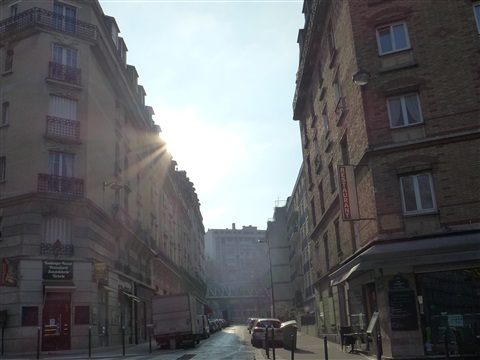 Now let's take rue Simonet, then rue Gérard on the left, and rue Jonas on the right which leads us to the garden Brassaï which ends into rue Eugène Atget. This is for me the opportunity to address a special thought to this great photographer of Paris, whose photos are an infinite source of inspiration for my strolls. This a real pleasure for me to go over and over again on the spots captured by Atget more than hundred years ago. The reason could be that I am in the search of the lost Paris of my childhood which was still the same Paris known by my grand-parents. What I can say is that his pictures provide me with a sweet fascination, and superimposing his mysterious Paris with the city of today give me the sensation to play a hide-and-seek game with ghosts. 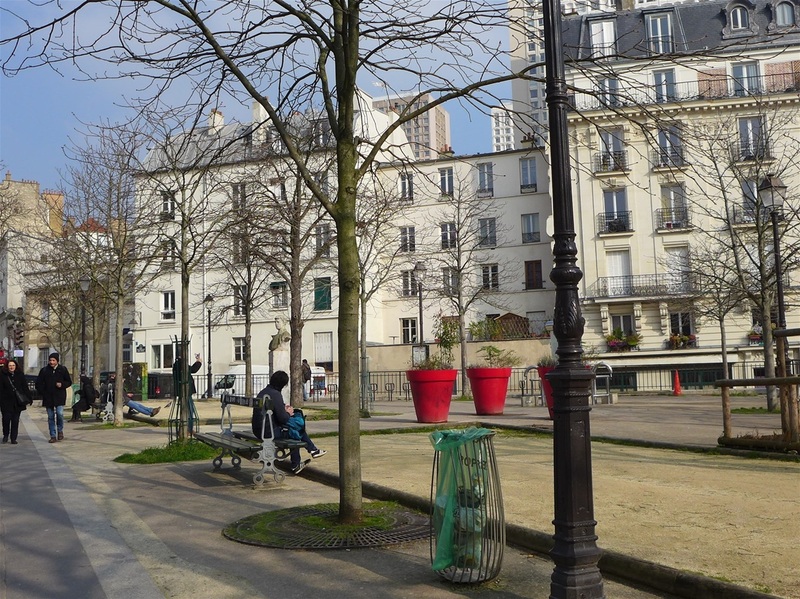 Let's turn on our left in boulevard Auguste Blanqui. 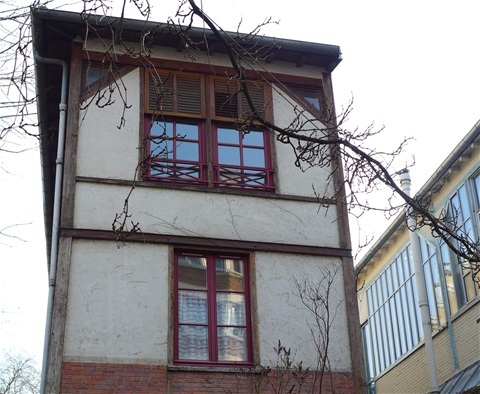 Let's stop at the junction with rue Barrault, at the Nr 1, where the adjacent building of the nursery is an old tannery; it still has its flat roof, its base made in bricks, its oak joists and the wooden shutters evoke the general shape of the old movable wood battens used for drying hides. The picture taken by Atget shows the two arms of the Bièvre river, the artificial one on the right and slightly beneath the natural one on the left going through the two archways across boulevard d’Italie (today boulevard Auguste Blanqui). 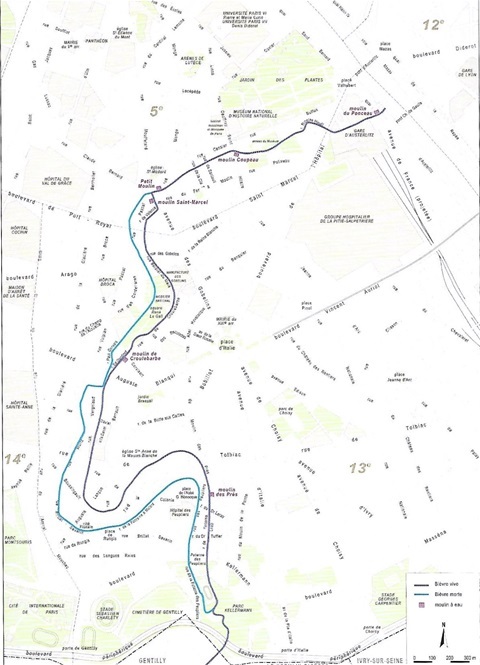 Compared to today environment, the natural arm of the river was going through the nr 91 boulevard Auguste Blanqui and the artificial arm was between nrs 85 and 89. This also explains why the two archways of the aerial metro, in front of these numbers, are larger than the others because of the two arms the river. 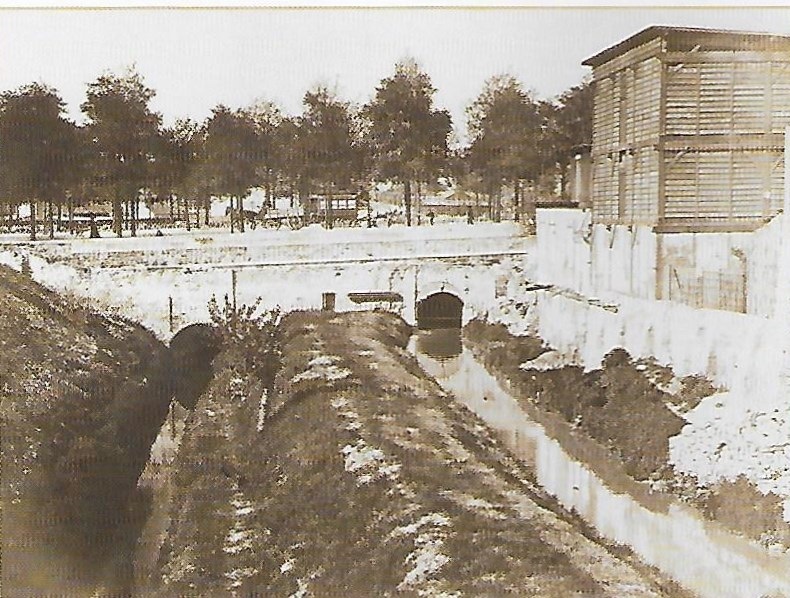 The underground parking of the modern building at nr 91 was built in the bed river and was covered by a lawn. Let’s now cross the boulevard. In front of us, slightly on the left we can see the offices of the newspaper Le Monde, designed by the architect Christian de Portzamparc and its facade illustrated by the cartoonist Plantu. Where there is today the block between the streets Edmond Gondinet and Paul Gervais, there was an island between the two arms of the river. The natural arm giving the winding shape of the rue Paul Gervais and the artificial arm giving the straight shape of rue Gondinet that we are going to take. 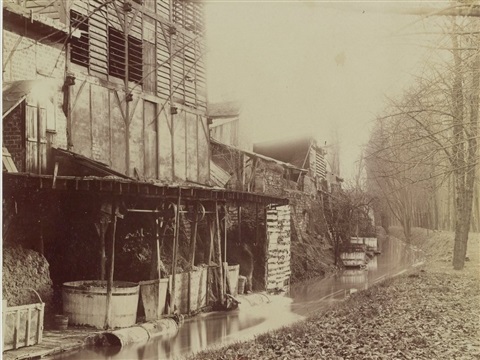 The picture taken by Atget in 1890 is showing the Bièvre river upstream. The slope on the right was separating the artificial arm of the river from the natural one. The building on the left is a tannery where the sheepskins, the goatskins and lambskins were softened and bleached in preparations made with flour and eggs. 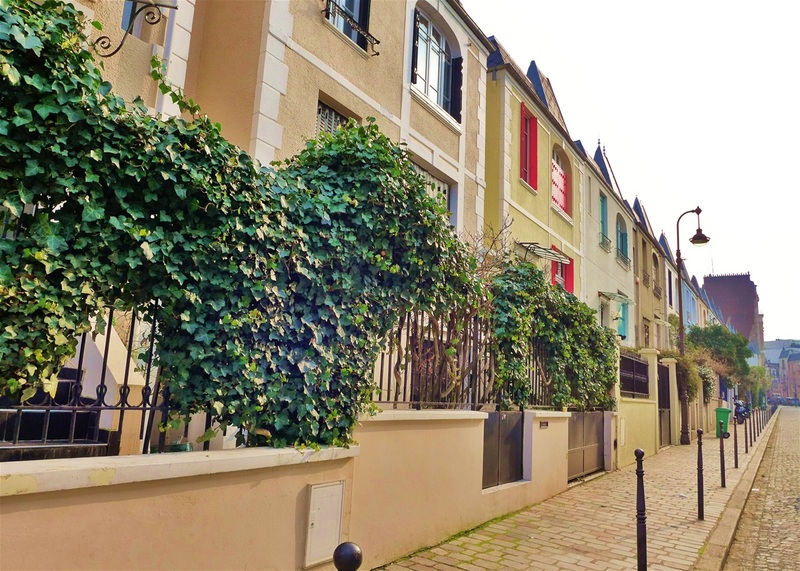 Let’s now proceed in rue Croulebarbe. 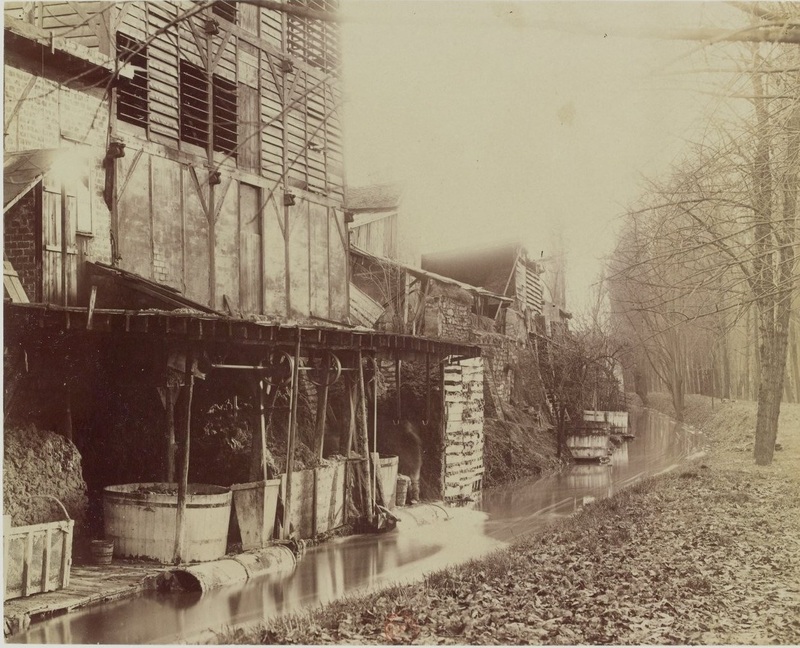 As shown by the photo taken by Atget, where today is rue Croulebarbe were the bank and the artificial river, called in this area the Gobelins river. 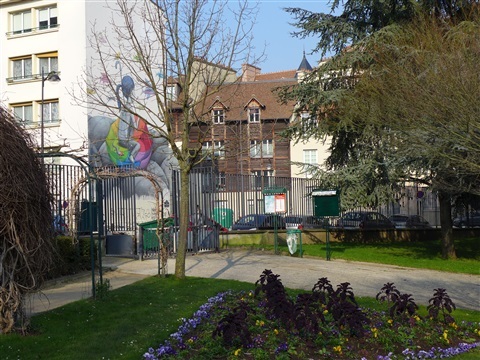 On the left behind the wall, there was the garden of the Gobelins Manufactory, today the public garden René le Gall. In the past, this area was an island between the two arms of the river, called l'île aux Singes (the Monkeys island). Why monkeys? there is no clear explanation. It may be because some animal trainers coming to entertain the workers of the Gobelins Manufactory would have left, letting some monkeys running at large. Another explanation could come from the slang, monkey meaning a boss. In the upstream part of the island, there were gardens dedicated to the Gobelins workers. 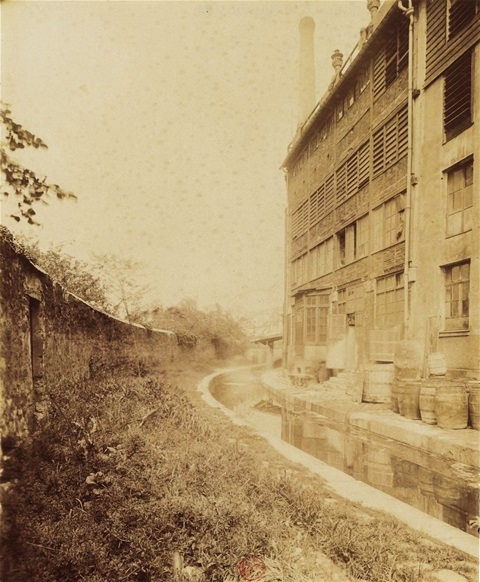 The artificial arm of the river was flowing behind the wall along rue Croulebarbe; the natural arm of the river was flowing where there are today the wall along the Rodin school and the one along the Mobilier National building, and was going through the Passage Moret, today rue Emile Deslandres. 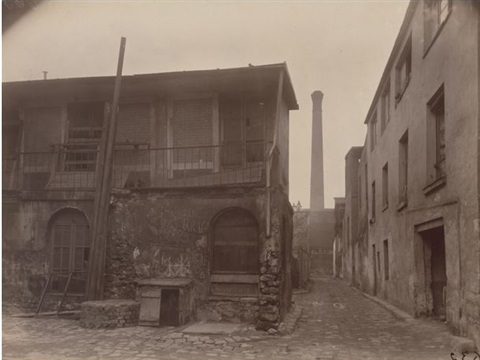 In this passage, rather a slum, a court of Miracles inhabited by leather workers wrote J.K. Huysmans, were grouped unhealthy tanneries between ruelle des Gobelins and rue des Cordelières. 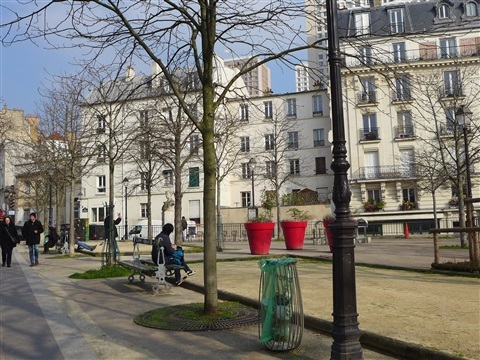 The island was completely transformed in the 1930s, the gardens replaced by the public garden René le Gall and the slum demolished and replaced by the Mobilier National building. Now let’s take the exit of the public garden located rue Emile Deslandres and turn on our right into rue Berbier du Mets. 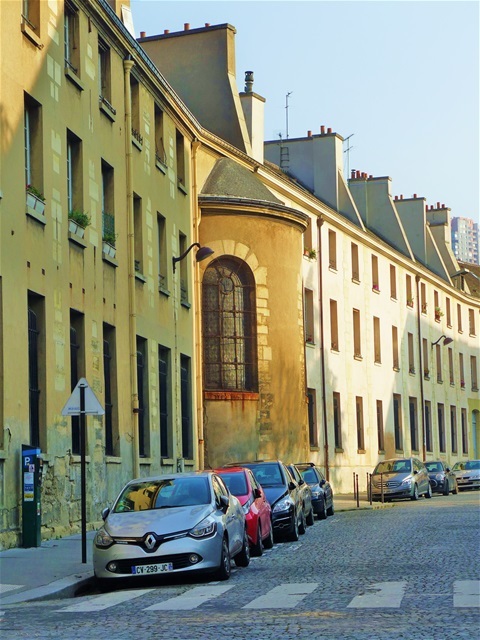 After rue Croulebarbe, the artificial arm of the river was then flowing where is today rue Berbier du Mets (former ruelle des Gobelins), at the foot of the Gobelins Manufactory buildings and of the chapel (no 3, rue Berbier du Mets). 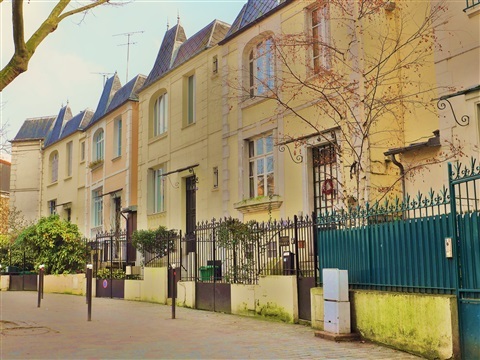 Because of the many legal actions brought by two determined inhabitants, the Gobelins forebay, located between 18, rue Berbier du Mets and boulevard Arago was the last part within Paris to stay uncovered. Their resistance ended with a measure of expropriation and the river was finally completely covered in July 1912. 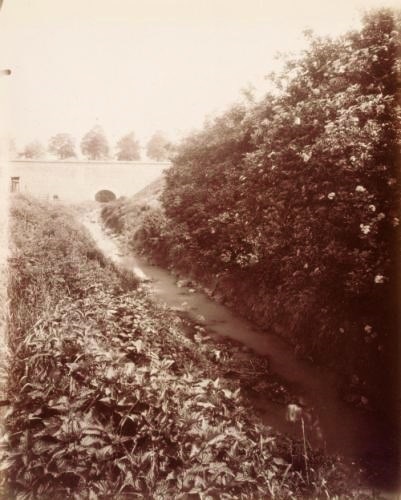 The photo taken by Atget shows the forebay, viewed from downstream. On this picture, at the back of the houses along the left bank, we can notice the roof and the last level of the brick building (18, boulevard Arago).